Price: 99¢ (as of 06/30/2015 at 6:00 PM ET). Doctor Lizzie Bennet, struggling against her conservative English countryside upbringing, determines to prove her worth as a dog psychologist. Nothing will deter her from her career until she meets the uppity and oh-so mysterious Londoner, Mister Darcy. His on-again, off-again flirtatious manner, and his pompous putdowns challenge Lizzie's short temper. 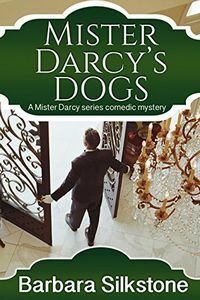 When Mister Darcy hires her to train his lovable basset hounds for an important foxhunt, Lizzie accepts the task despite knowing next to nothing about the sport and harboring an intense fear of horses. Two of the villains Austen fans love to boo and hiss arrive to torment Lizzie: Caroline Bingley, in hot pursuit of Mister Darcy does all she can to discredit and humiliate Lizzie. Mister Darcy's old nemesis, George Wickham, stalks the Bennet family. Will Lizzie keep her focus or succumb to her fate? And what, pray tell, is her fate?